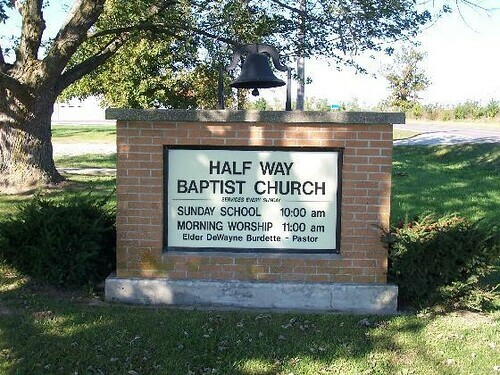 Welcome to Half Way Baptist Church | Flickr - Photo Sharing! While cruising along MO-32 on a beautiful October morning I spotted this sign for Half Way Baptist Church. It immediately brought a big smile to my face so I stopped, made a U-turn, and took this picuture to remember it by. For many years I have commented to friends that I have never seen a Half-Gospel church or even a 90%-Gospel church, but there are thousands of churches that call themselves "Full Gospel." Now I can say that I've seen a Half-Way church. That's not Half-Gospel, but close. Notice that the town is called "Halfway" (one word) but the church is named "Half Way" (two words). Is this subtle difference intentional? I doubt it. Half Way Baptist also reminds me of a church in Augusta, Georgia called One Way Baptist Church. Does Half Way Baptist get you only half the way to Heaven? Does One Way Baptist think that they are the one and only way to God? Do other people ponder these things? Probably not. HAHA no the name of the town is Half Way. 9we are HALF WAY bewtween Bolivar and Buffalo) According to our town's history the name of the town is 2 words, but over the years some people have shortened it to 1 word. We are not Half Baptist. It just makes me mad that you would even think that we are. We are fully missionary baptist. And if you were so curious you could have stayed around and attended one of our services.